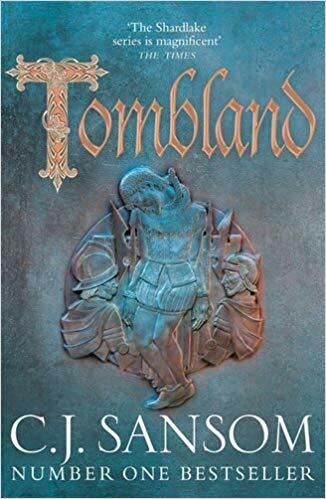 This is my first review of an audio book because, although I’m a subscriber to Amazon’s Audible account, to date I’ve only ever downloaded books that I’ve already read in print form. But last month, stumped for something to listen to, I contacted Bernadette from Reactions to Reading. 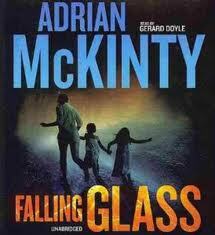 As readers of Bernadette’s blog will know, she regularly reviews audio books and she suggested I try Adrian McKinty’s Falling Glass. McKinty is a relatively new author for me, although I enjoyed the excellent Cold Cold Ground, so I was interested to give one of his earlier books a go. Rachel Coulter, the ex-wife of the famous Irish airline entrepreneur Richard Coulter, has disappeared with their two children. Although he has information that she is hiding out at one of Ireland’s caravan parks, an attempt to seize back the children ends disastrously. Killian, fresh from a successful debt collection job in New Hampshire is called in by Coulter to track down Rachel and retrieve the missing children. Killian is confident that he will find the missing family and is successfully on Rachel’s trail when Coulter’s team realise that she is also in possession of an incriminating laptop. They hire a tougher enforcer to follow Killian and ensure the laptop is retrieved at any cost. Markov, a former Russian soldier and veteran of the Chechen conflict ensures that a routine job becomes a murderous spree. The early part of the novel takes you from Boston on St Patrick’s Day, to a wealthy beach town in New Hampshire and a gang leader’s ranch in Mexico. However, when the threads of the story start to come together, it is the descriptions of Ireland that leave a lasting impression. As Rachel runs from one hide-out to another we are given descriptions of windswept holiday parks teetering on the edge of Europe with the sound of the Atlantic roaring in the background. The pace of the story comes and goes which I thought was a clever way of presenting what could be just a straightforward thriller. Markov is clearly the villain of the story although the damage caused by his participation in the Chechen conflict is also made clear. The scenes where he and Killian battle it out provide plenty of tension although Killian seems forever out of his depth. In the final part of the book, leading up to the denouement, the pace slows right down and we are given an insight into the Pavee culture that is Killian’s background. This interesting section highlights the history of the Irish travelling community and its identity distinct from the Romany culture. My only regret is that I would have preferred to read this first. Audio books will never replace the written word for me, but listening to the novel has made me want to read more of the McKinty’s earlier books featuring Michael Forstythe who plays a minor but memorable role here. I bought my copy of the audio book. Other reviews (of the print version) can be found at Eurocrime and Review from the Blue House. The author’s website is here. Sounds an interesting book. I find the audio format quite hard to concentrate on, though I’ve enjoyed listening to a few classics eg Austen, Dickens, Trollope on audio – maybe, as you point out, because I’ve already read the print book (ages ago), or maybe because they don’t have convoluted plots in the manner of crime fiction! In some ways I prefer audio books, often finding them more immersive than print books and I remember more and for longer too. It probably has a bit to do with where I read – often on public transport or other crowded and noisy spaces – I used to miss out on reading on those occasions because I could not concentrate on a print book with all the noise but when I discovered audio books I was in heaven. Other than the first 10 or so minutes of a book (which I’ll often have to listen to 3 or 4 times because of lack of concentration as I get used to a new narrator) I don’t seem to have any problems following complex plots. Glad you enjoyed this one – I did too though some of the violence was a bit over the top for me. I listen to a lot of audio books but I’m pretty sure this is the first time I’ve listened to a book I haven’t read. It did take me longer than reading a book would have but this didn’t hamper the experience at all. There was once very violent scene which I would have preferred not to listen to but I’ve read worse! Sarah – This does seem like an interesting read. I’ve listened to some audio books, and to me, they are a continuation of the tradition of storytelling, which has gone on for thousands of years. But I think I’m more accustomed to print stories and I find them a little easier to remember.